Today is Pocky Day! 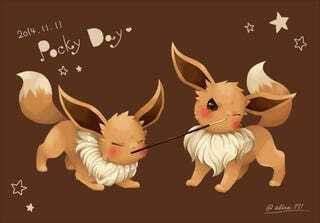 So Happy Pocky Day! The iconic snack has its own day in Japan. While hardly a national holiday by any stretch, people online have been celebrating in an array of different ways. November 11 is Pocky Day, because 11/11 looks like Pocky sticks, no? Japanese snack company Glico uses the day to get people to buy Pocky as well as its salted cousin Pretz. This day is actually acknowledged by the Japan Anniversary Association, but to be honest, that group has recognized unofficial holidays for pretty much every day of the year. So, yeah. Pocky is popular with the young and old alike, but online, it's mostly students who have been having fun with Pocky, whether that's playing the "Pocky Game," which is like a game of chicken with Pocky and near kissing, making Jenga-like Pocky sculptures, creating fan art, and much more. In short, people have fun.